How Do I Change My Default Web Browser in Windows 10? - Ask Leo! Changing the default browser used to be simple -- and then along came malware. 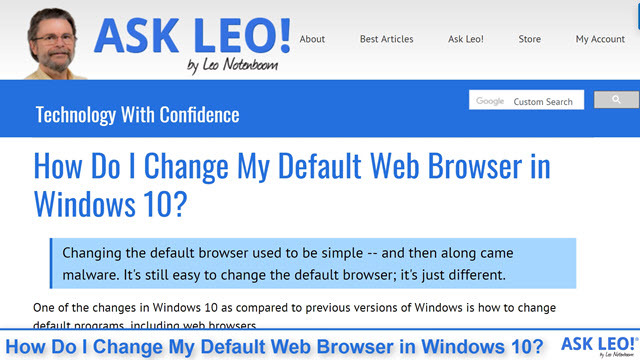 It's still easy to change the default browser; it's just different. 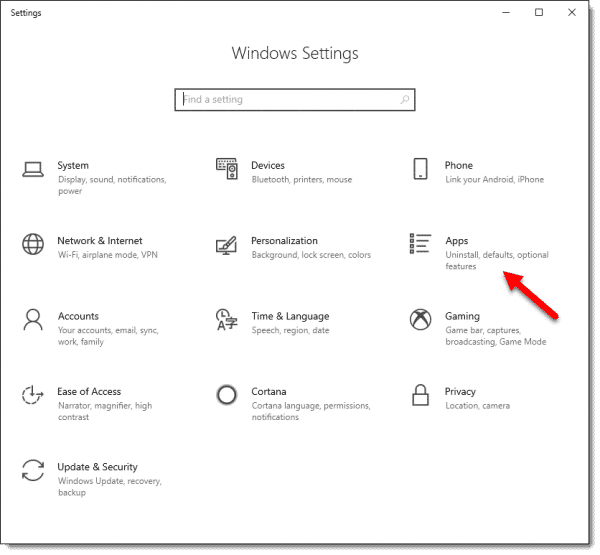 One of the changes in Windows 10 as compared to previous versions of Windows is how to change default programs, including web browsers. 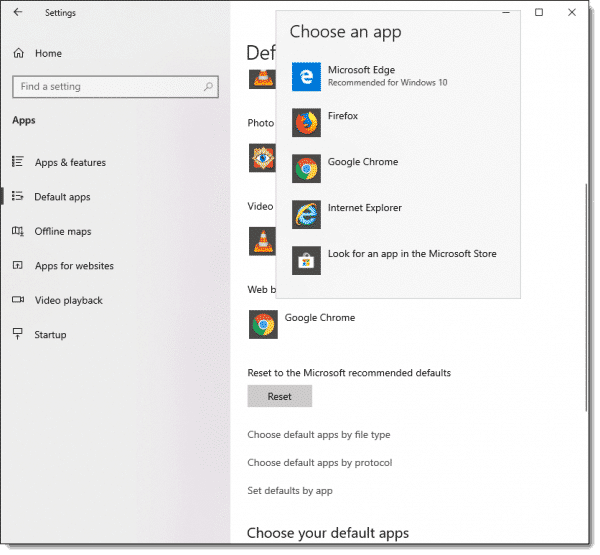 Changing the default web browser in Windows 10 is pretty simple; it’s just different than it once was. I’ll explain the reasoning, but first I’ll show you how. First, I’m going to assume that you already have the browser you want to use installed. If not, download and install it now. It may offer to set itself as the default, but there’s a good chance that won’t work. Run the Settings app (right-click on the Start button and then click the gear icon). The Apps link in Windows 10 Settings. 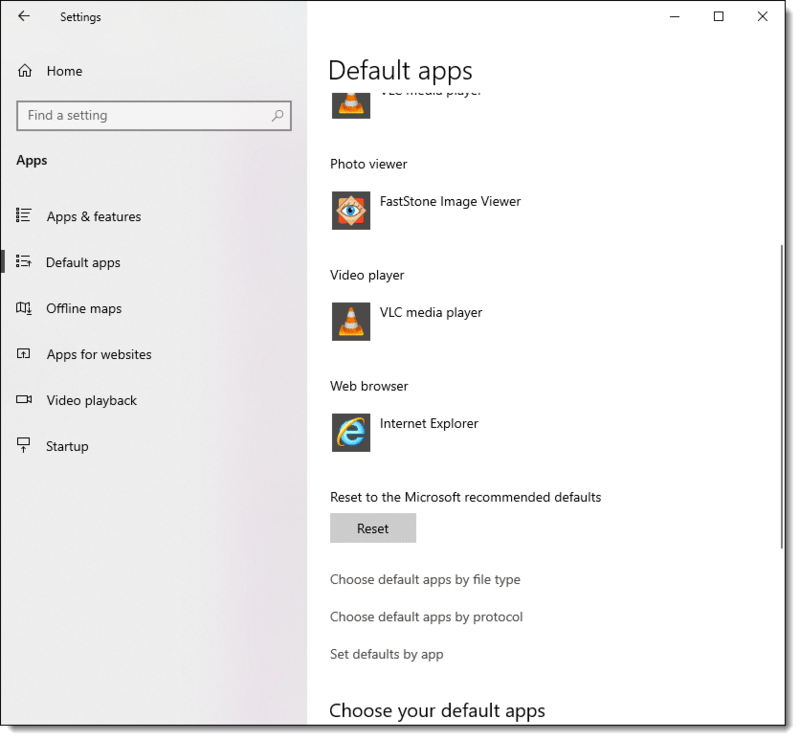 Click on Default apps in the left-hand pane. 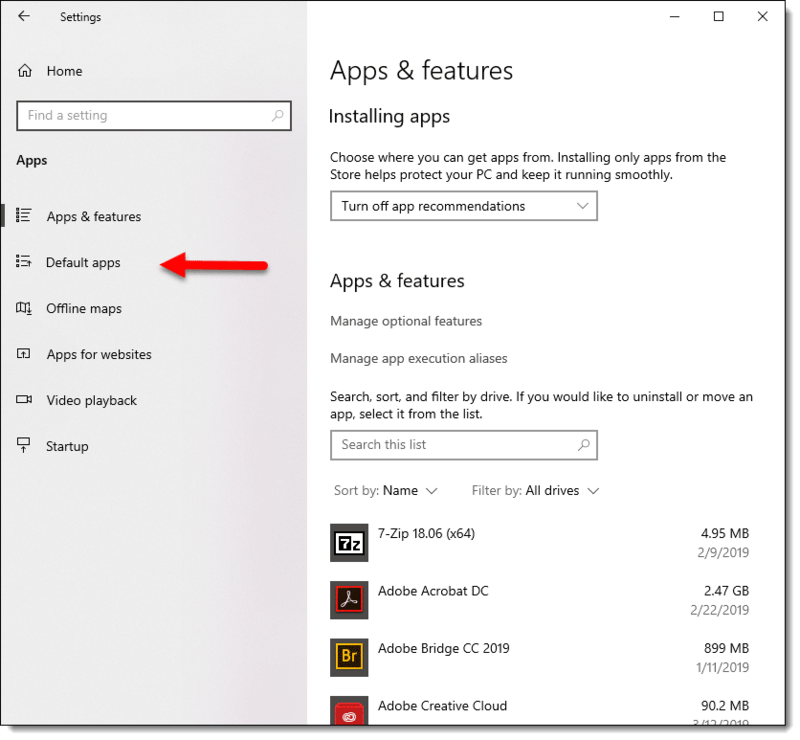 The link to change default apps in Windows 10. Now scroll down until you find the entry “Web browser”. Below that heading will be the icon and name of the currently-selected default web browser. In the example below, Google Chrome is the currently configured default. Click on that. The default web browser setting in Windows 10. A list will pop up of the available candidates installed on your machine. Choosing a new default web browser in Windows 10. In the example above, the list includes Edge, Firefox, Chrome, and Internet Explorer. Click on the one you want. 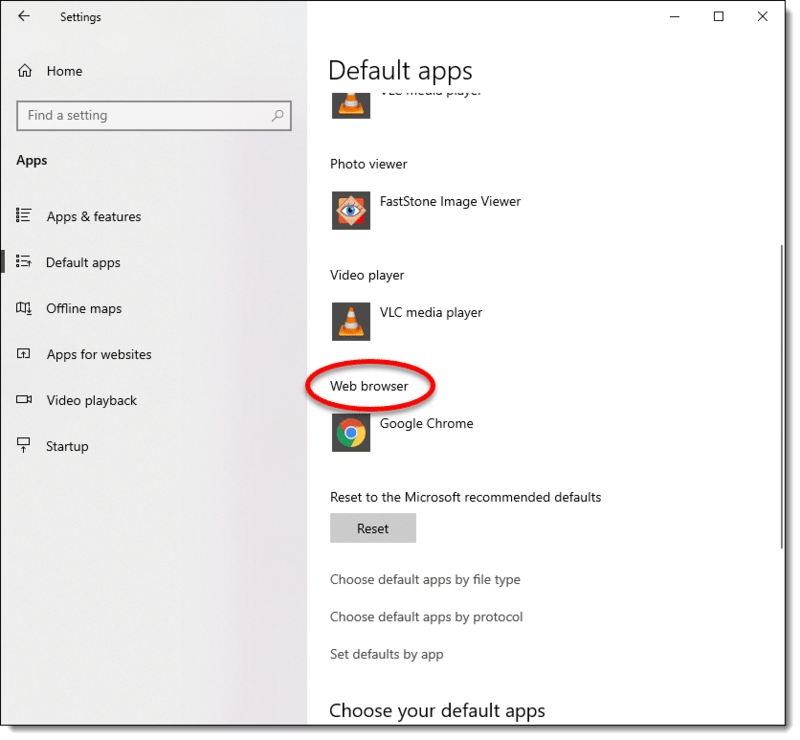 The newly-selected default browser in Windows 10. The default has been changed. Close the settings app. I have to add one caveat. Microsoft Edge is hard coded in some places in Windows. That means those places will completely ignore the default browser settings no matter what you do. That list is constantly changing, though Cortana has been the most obvious. Fortunately, the list is getting shorter due to people’s negative reactions to this behavior. I advise that you do nothing about it, as the issue is becoming rarer and rarer; even Cortana is becoming less intrusive. If you can’t live with the behavior on your machine, there are apps that attempt to force use of the default browser over Edge. One such popular app is Edge Deflector, but as with all such random third-party solutions, use with caution and at your own risk. It used to be web browsers could set themselves as the default. Either when you installed the program initially, or each time it was run, the browser would check to see if it was the default, and offer to set itself as such if it wasn’t. Allowing it to do so was all you needed. Then along came malware in the form of PUPs, browser hijacks, and more. If a browser could change the default on its own, then any program could also change it, whether you wanted it to or not. Now, whenever any program attempts to change the default, it brings up the Settings app for you to do it manually. Or not. This prevents unexpected and unwanted changes from happening behind your back. Change the Search Engine in Microsoft Edge - It is possible to change the default search engine in Edge; it's just not obvious. Yeah, well, I use “portable apps” when I can, and place them on the desktop. One is Thunderbird for E-mail. Another is Palemoon for my browser. I have not found a way to have/make the portable stuff work as a default in Windows 10. In Windows XP this was not a problem. Perhaps there is a way, but I haven’t figured it out yet.